What Causes the Inside of a Microwave to Crack? Its hulking mass is prevalent in kitchens across the world, and many garages as well. The microwave is a sturdy, helpful cooking appliance that is often taken for granted for its powerful components. 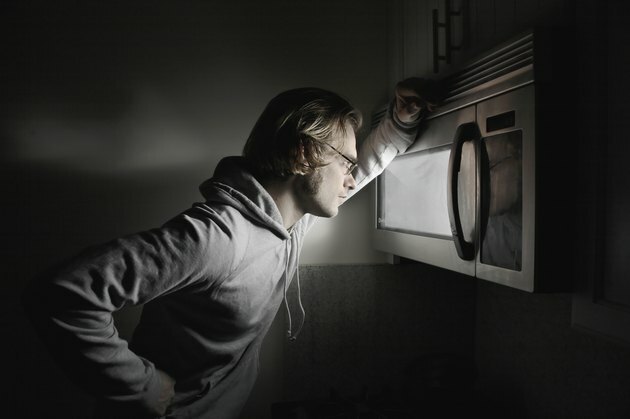 If a crack has formed on the inside or outside casing of a microwave that is in regular use, it's fair to wonder if it is actually safe to continue warm up your quesadillas or morning cup of brew. It's long been thought that a microwave oven, particularly if not used properly or with great care, can cause cancer. Actually, microwaves use radiofrequency radiation. Although it sounds like a mouthful, it's nothing to be alarmed about as it is the same radiation that floats around you in everyday life from the sun and other natural sources. While the radiation produced is more concentrated, it is safely contained within the housing, even if you pop open the door before the timer ends. If radiation should ever leak out due to serious damage or alteration by the user, the most damage it would do would leave a burn on your skin. That is less of a burn than steam from a teapot. It's also okay to stand in front of the glass oven door, just don't press your nose against it. Microwaves are one of the more heavily used appliances in the kitchen, behind the daily opening and closing of the refrigerator and freezer. They are often also mistreated due to the frustration of the user or lack of cleanliness by multiple users. When a metal utensil, bowl or wrapper is put in the microwave, it can cause cracks in the bottom of the microwave oven. Some ceramic dishes may inadvertently contain metal or other material that is not conducive to microwave cooking. Make sure to read whether or not the item being placed in the oven is microwave-safe. If the door is slammed and a crack begins to spread, the microwave should not be used until the door is safely replaced. Microwaves can leak out in small proportion but there is a potential for a burn to occur on the user. A specially designed sealant can repair minor cracks inside the microwave oven without posing any health or fire risks. If the housing is slightly cracked on the vent or door handle, it shouldn't affect the use of the microwave in any way. If the spinning plate cracks, the microwave itself isn't truly affected, but if you continue to use the microwave without the spinning plate you run the risk of cracking the interior. The spinning plate helps to disperse the heat rather than have it concentrated in one area. This can lead to a hot spot that can cause serious issues when the microwave is in use. Can I Operate a Microwave Oven Without the Waveguide Cover? Can You Cook With Corningware on the Grill?